I was asked recently how much more it costs to develop a customised training course rather than run one of our standard courses. So I looked carefully at a recent course I customised for a supplier of maintenance services to the mining industry and worked out that both the client and I had each spent an additional 5 days of our time. That’s a real commitment in terms of time and money from the Global Head of Sales at our client, over and above the cost of a standard training course. Was it worth it? It’s hard to measure these things accurately, but I estimate that only around 20% of off the peg Sales Training ‘sticks’ and is still being used by Sales People 12 months later. For customised courses the figure is much closer to 80%, which I believe represents a far better return on investment. Customisation on its own won’t deliver the best possible results. It has to be done in conjunction with training the Managers to provide coaching and the right technology to embed the Sales Process in the way everyone works - get all 3 elements right and training really starts to make a difference and carries on making a difference for a long time. I will walk you through how we customised the Sales Training programme for the client I mentioned above who supplies maintenance services to the mining industry. The first thing was to really find out why they needed Sales Training. What was their pain point? The organisation had a good insight into their own problem. They have a strong standing at mines where they already provide services, so when existing customers approach them, they are very good at converting those leads. But they were poor at identifying and approaching new prospects, especially outside their home territory. This was even the case when an existing customer opened a mine in a foreign country. The first thing we did was to sit down with Senior Managers – the Global Head of Sales and the Head of the North American operation - and showed them all of our concepts related to targeting new customers. Then we evaluated which of these concepts and tools were most relevant to their problem and decided which ones we would use and how they should be customised to meet their specific needs. It was important to adapt the training to their business rather than expect the business to adapt to our concepts. Having a common language is an important factor in making training stick. Unless everyone uses the same terminology, especially the Managers who are coaching the Sales People, the sales training won’t deliver results. We established that the client in the mining industry felt more comfortable with certain terms, for instance referring to the Buying Group rather than the Buying Center, so it was no problem changing that and other terms in the training materials and supporting software. Then we worked together to come up with 11 distinct concepts that we needed everyone in the training to understand thoroughly. For each concept, our client developed a good example for the mining industry which is used in the trainings to explain the concept and its benefits. The key thing to ensuring that every participant fully grasps each concept was to make certain that the examples were relevant. Of course we use lots of examples in our off the peg training material but it would be too big a leap for some of these guys who have been in the mining industry all their lives to relate to an example that relates to a software or consulting sale for instance. So we worked closely with the Head of Sales to produce a case study that was closely based on a real scenario that everyone in the classroom could relate to. As most of you don’t work in the mining industry I won’t go into details, but an additional benefit of working this way was that I gained knowledge and insights into the mining industry that really helped when I was running the course. So in theory everything was set up to run an excellent first training. Right? We don't run a training course unless we are certain that it will deliver the expected results. So before running the first session for sales teams we had a dry run with the heads of all regions around the world. This revealed some areas where there was room for improvement and we made changes before the first session for the sales teams. The dry run also had the benefit of getting buy-in to the content and required coaching from those senior managers. This particular company has a set of core values they really believe in. All too often this is a slide somewhere in a sales presentation that is never referred to again and is rarely experienced by the customer in the way a sale is made. But this client is different and they are committed to their values so we created a 12th module based on these values. The objective was to reflect the values in how their Sales People sell. The idea being that a potential customer would begin to feel how it would be to deal with the company as a result of the way the sales process is conducted. Did customisation make the training stick? It’s too soon to tell, we have only rolled it out to one region so far – the rest follow later this year. But I am very optimistic. I was told to expect resistance from a couple of individuals and the whole group were experienced Sales Professionals who had been in the mining industry for years, rather than graduates who were keen to learn. As it turned out, there wasn’t any resistance from anyone. I am sure that the close relevance of the examples and exercises in which the concepts were applied on the participant’s own current opportunities made a huge difference to their level of engagement. And they worked on the exercises with the people they normally work with. So two sales people and two operations people were in each group and they were working on a very relevant case study or an actual project. We also had them using the software they will go on to use after the training. I was even complimented on my product and knowledge of the mining industry, although this was my very first client in that industry! When we have rolled out this training and certified each participant’s implementation, we will work with the client to see just what difference this level of customisation has made. Looking at on the results so far I am confident it will be a very good return on education. Have you been disappointed at the impact of sales training 1 year on? What do you do to maximise the return on education? 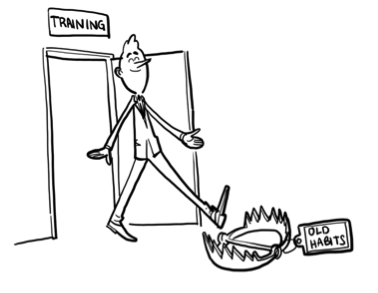 Do your training providers adapt their concepts to fit your business?